I know I probably sound like a broken record, mentioning yet another Djeco toy… but it really seems like they can’t go wrong. I recently got this Djeco Geoforme boxed set for my boys and it is a huge, huge hit (other than the fighting over the pieces!). 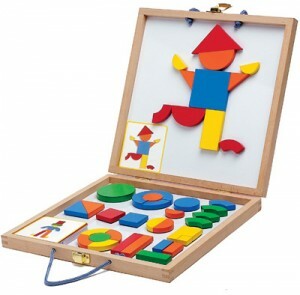 It’s essentially a box with a magnetic inside, and it comes with 42 colorful magnetic shapes to form different objects and scenes. Your kids can create their own images, or they can use the cards to give them guidance. My 4-year-old really gets the hang of it, and the 2-year-old really just likes sorting the shapes and colors together. Either way, it’s fun for them AND educational! I like it. Thanks! In Spain, we are now waiting for the 3 Wise Men! Happy 2010! this looks cute. and i like that you actually have to replicate the shape instead of just placing the shapes on top of a large card. djeco toys are just great, all of them! another good suggestion as always!